I love food, and I’ve gotten pretty good at cooking. (Okay, pretty damn good.) And as I promised in my inaugural post, I’m going to offer the occasional recipe here. For this dish, I use chicken thighs, since I think they’re the best part of the chicken. As for vegetables, I mix it up. 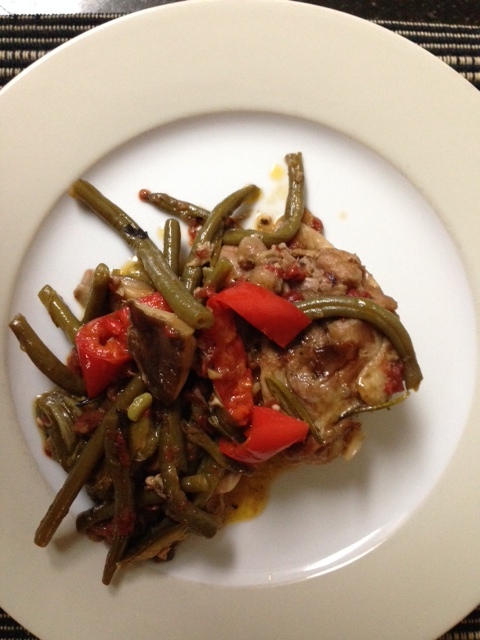 I use different combinations of green beans, eggplant (make sure you sweat it first), red pepper, mushrooms, okra. • First, cook 3 or 4 pieces of chopped-up bacon in the Dutch oven, remove it and save the pieces. • Salt and pepper the chicken thighs (6 to 8 of them), and brown them in the bacon grease. Remove the thighs. • Sauté a minced onion and a couple of garlic cloves until they’re soft. • Add a small can of drained diced tomatoes, half a cup of red wine, half a cup of chicken stock, a sprig of rosemary. Add salt and pepper. • Let this cook for a couple of minutes, then return the bacon and chicken to the pot, and put the vegetables on top of these (altogether it’s around 1 ½ to 2 lbs of vegetables). • Cover the Dutch oven and let it simmer on the stovetop for around 90 minutes. The chicken should be very tender and the vegetables well-cooked. I’m on a low carb diet, so the dish as is works for me as a complete meal. You could serve it with rice or some such thing, if you wish. Definitely have a nice bottle of red wine on hand. You need to have a good Dutch oven for this. We have Le Creuset. They’re expensive, but well worth the money. I use it all the time.